If you want to learn about choosing the best convertible car seat, then you’re in the right place. When searching for a product for your kid, you have to gain as much knowledge as possible on any specific item. It’s the only way to be sure of making the best possible choices. Because we know that being a parent puts a lot of pressure on your available time, we’ve done some thorough research on everything we could find, from the process of choosing an infant convertible car seat, to the best rated models in this category. Our mission with this guide is to offer you everything you need to know in one place, this way not only helping you make smart decisions, but also save some time in the process. Let’s jump right into it! 1 What are Convertible Car Seats? A convertible car seat is a great choice for both babies and toddlers. They’re designed specifically to offer the same level of safety and comfort for babies and toddlers alike. Convertible car seats face either the back of the car or the front of the car. This basically depends on the weight of the child. If you’re kid has a weight that doesn’t surpass 30 pounds, then it’s recommended he sits in a rear-facing car seat while travelling. After weighing more than 30 pounds, your child can use the seat facing the front of the car. From a safety point of view, seat that face the rear are much safer than those facing the front. 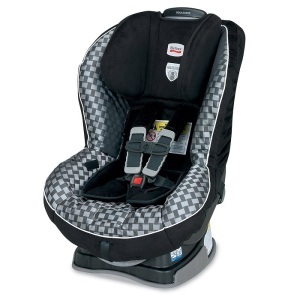 Checking for weight limits when purchasing an infant car seat is an important thing to do. If you choose to buy online, you can find this information on most product pages. If you buy in a brick-and-mortar store, then you should be able to find the information on the side of the seats. This is an important step before deciding if a specific model is an appropriate choice. Nowadays, it’s pretty hard to imagine travelling with your infant or toddler, without a car seat. There are so many benefits of having a convertible car seat, both for you and your child that choosing not to get one is just wrong. First and foremost, your child is the primary beneficiary of this product. He’s going to travel a lot more safely and comfortably sitting in a specially designed seat than not. Such a seat offers the necessary protection for your child in case of an accident. You might think you’re a great driver but accident can happen without your fault. Infant car seats also give your kid the ability to take a comfortable nap if he feels like it. Most models connect easily to the backseats of your car and also offer the little ones the freedom to play safely while on the road. Using an infant car seat is not only something that we recommend, but also something that the law in many countries require from parents. A convertible car seat will, generally, fit in mot types of cars. The design of these seats is made to be highly adjustable. You will be able to use it for your child for the first years of his life, offering a perfect level of comfort along all the initial stages of his development. They also represent a financially-wise choice because you will not have to buy a different car seat every year. Most of the models across the range include shoulder straps that make sure your child remains safely in the seat in case of an accident. The headrest that you can find on many models give your child a comfortable posture, especially during longer trips. Added accessories such as cupholders make for a nice bonus, because your kids need to always maintain a good level f hydration when on a few hours’ journey. Once installed, it’s just a matter of getting your child in and out of the seat. The installation process is very easy with most models, but we recommend you get it checked by a professional before using it, for extra peace of mind. The latest convertible car seats are greatly enhanced to ensure your kid’s safety during a road trip. It’s made using safe cell technology, that gets compressed in case of an accident, lowers the center of gravity and counteracts the force that would normally push the seat towards the front end. Let’s take a look at the specific features that make the Britax Marathon G4 car seat one of our favorites. It is equipped with side impact protection that is comprised of deep side walls lined with energy absorbing EPP foam. It’s designed to distribute crash forces, shield from vehicle intrusion ad keep your kids head neck and body perfectly contained. The 5-point harness provides a safe fit and, in case of a crash, distributes the forces across the strongest parts of the body. Easy installation due to the premium lower latch connectors. Also, it offers easy release with a push button design. The Peg Perego Primo Viaggio Convertible Car Seat made it to our list because, although it’s in a slightly higher price range, you really get what you’re paying for. It’s very stylish and the materials used are, like the name suggests, premium. It is reversible, letting you use it rear-facing for children between 5 and 45 pounds, and front-facing for children between 22 and 65 pounds. It’s easily adjustable, in 10 positions, even with child in sitting inside. The Side Impact Protection System offers an increased protection for the head, neck and back area. Throughout the seat, energy absorbing foam makes sure that, in case of a crash, your child is safe. It has a contoured back plate that minimizes forward movement. The base of the seat also contributes to decreasing the forward push. The top tether hook limits forward movement and increases stability when in forward facing mode. It’s also very easy to install in most types of cars due to the adjustable latch connectors. 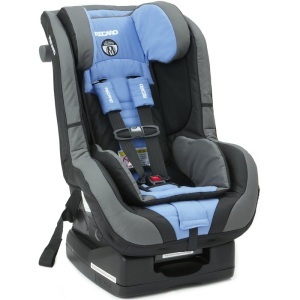 The RECARO ProRIDE convertible car seat is designed to be used wither facing forward or backward. It has several safety features like side impact protection, head restraint and vehicle belt lock-off mechanism. It’s very easy to use and comfortable for the kids. Forward and backward facing capability, with extra protection for head, neck, back and pelvis area. The Safety Stripe System on this car seat lets you know when a twist could begin or has begun, so you can act in time to prevent any hazard. It’s has EPS foam all around to absorb forces and protect your child, and also offer him a comfortable ride. You can put your child in the rear facing position if he has a weight between 5 and 40 pounds; and into the front facing position if he’s between 20 and 65 pounds. The height limit is 49 inches for both seating positions. It’s certified for use during air travel when in harness mode, with the seat belt of the plane. The Diono RadianRXT is convertible and booster car seat that you can safely and comfortably use for your child from the moment he’s born up until he reaches 57 inches. Many states require you to use a booster seat once your child has outgrown the infant car seat, so it represents a wise value for money choice. Even if your state law doesn’t require you to use a booster seat, it’s still a good thing to do, for your kid’s safety. 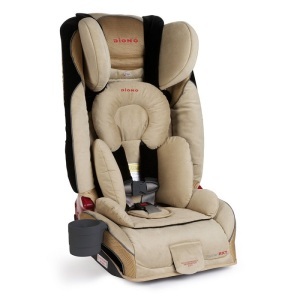 The Diono range of car seats are the only convertible + booster car seats with a full steel frame. This makes them very safe. You can put your baby in the backward facing mode, if he weighs between 5 and 45 pounds, or in the front facing mode, between 20 and 80 pounds (or up to 57 inches in height). You can use it as a booster seat until your kid reaches 120 pounds. It has memory foam and support cushions for increased comfort. 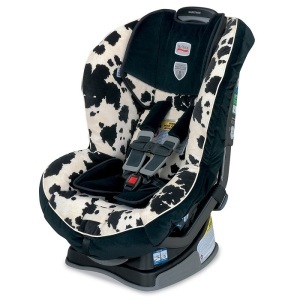 It has a 5-point energy absorbing harness system and EPS foam lining that adds to the safety level. 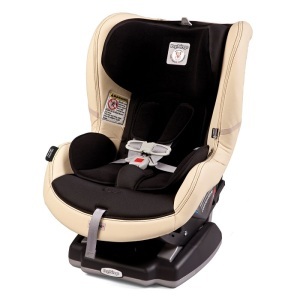 The Britax Boulevard G4 is one of the safest convertible infant car seats out there. It’s designed to offer the much needed protection your child needs, in the case of a crash. Parents who have purchased this seat for their children say that their kids stopped complaining, after they installed the G4 instead of the ones they used to have before. The base features safecell technology, that prevents the forces of a crash reaching the passenger. It offers increased side protection for the head, neck and spine area, with an extra layer of shock-absorbing EPP foam on each side and thick side walls lined with EPP foam that distribute the shock. It features a 5-point, tangle free harness that also distributes the shock across the strongest parts of the body. Easy installation with premium lower latch connectors. During our research that lead to our top picks above, we made sure to check every reviewed model for the safety aspects that are listed below. We’re giving you these safety guidelines, so you know what to check for, if you want to do some research of your own. Probably the most important function of a convertible infant car seat is to keep your child safe in the case of an accident. One of the most vulnerable parts is the neck area. Make sure that the model you think about purchasing has good neck support for your baby. We recommend you go for a model that features a 5-point harness system: 2 waist straps, 2 shoulder straps and one strap between the legs; all of them meeting in the middle, for maximum safety and comfort while on the road. The materials used in producing the car seat make the difference in crisis situations. The frame has to be solid, and it’s preferable to go for a model that has shock absorbing foam all around. These 2 characteristics increases the safety of a convertible car seat. Before deciding on a certain model as being the best choice, go through various options and check for safety, comfort, design and other specific preferences that you might have. We’ve presented you our favorites above in the hope that we can help you easier find one that fits your needs best, while saving time along the way. Last, we recommend you read some customer reviews before deciding which is the best convertible car seat for you.